Friday, August 23, 2013 #10 Jauveer Hammond leads his team mates onto the same turf that Rebels have conducted Friday night battles for over fifty years. The difference this year is that this troop of players emptied out of a state of the art field house and took their place on the west side of the expanded stadium for the very first time. The victim, this night of celebration, was the Silver Bluff Bulldogs. 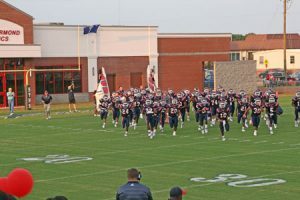 Head Coach Al Lown knew that what was always a hard fought battle would be exponentially more difficult with Strom Thurmond christening the renovated stadium after half a century of winning football tradition. His prediction came true as quarterback Jauveer Hammond led an air and ground attack that methodically piled up points while his defense maneuvered to hem up the speedy Bulldog offense. The always feisty Silver Bluff squad stood their ground for the first twelve minutes allowing the Rebels to only get close enough to register a 27 yard field goal by their placekicker #99 Cole Fell. The physical Rebels began to take a toll on the Bulldogs in the second quarter as Thurmond’s quarterback used all the weapons available to him to score two touchdowns before the half. Third quarter action began with the Rebels leading 17 to 3 and in position to receive starting the second half. Controlling the ball for the first five minutes and fifteen seconds, in true Rebel fashion, portended the outcome of this contest. Strom Thurmond’s Chad Gilchrist scored the third TD for the Rebels and Delonte Bates got the fourth in the fourth. Silver Bluff’s proud football history was prominent throughout the game but especially late in the contest when their never quit personality garnered them 15 points and reason to look forward to another successful season.